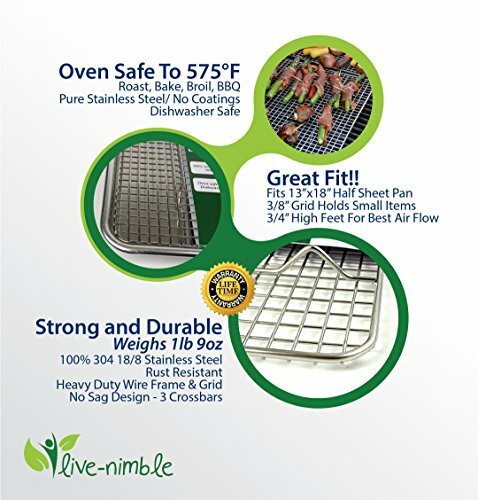 Live-Nimble Premium 100% Stainless Steel Cooling Rack Also Cooks, Roasts, Grills to 575°F. 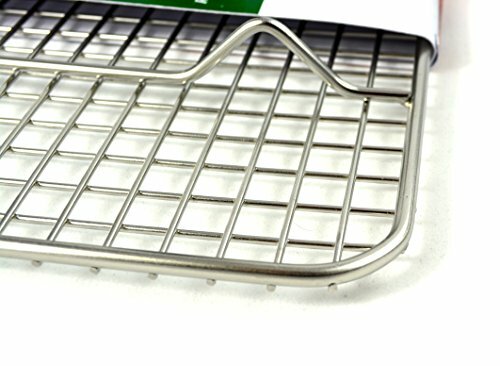 Heavy Duty Wire Grid Cools Cookies Perfectly. Fits 8.5"x12" Quarter Sheet Baking Pan. Product prices and availability are accurate as of 2019-04-01 11:43:30 UTC and are subject to change. Any price and availability information displayed on http://www.amazon.com/ at the time of purchase will apply to the purchase of this product. Life is complicated, live-nimble. Move more easily between your demanding roles in life. How can this rack and mat enhance your cooking skills and make your life more simple? - Oven safe, dishwasher safe, no-rust, and NO COATINGS to contaminate your food! - Perfect for any diet or lifestyle! Healthier more delicious food! - The rack can do all this and more! - ROAST - intensifies flavors in vegetables, fruits, and meats. Enhances Maillard effect. Especially popular for crispy chicken wings, bacon, whole chicken or pieces. - WARM - for crispier re-heated pizza crust or moist tortillas. - DEHYDRATE - save $$ by making kale or brussels sprouts chips, dried fruit, jerky,etc. 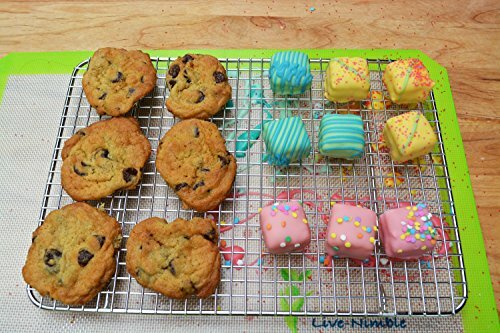 - DECORATE - coat, enrobe or drizzle designs on any food. - Other uses - drain washed fruit and veggies, as trivet, hold items for freezer or refrigerator, an excellent multi-tasker!! 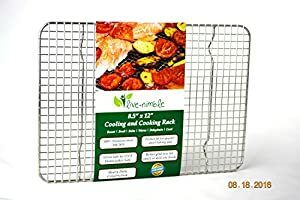 Why is this the best cooking rack on the market? - A Bonus e-book Fifty Nifty Recipes gives tips and recipes to best use these tools and enhance your cooking skills. Cook healthier, easier, cleaner, and more delicious. - Rack is unbelievably heavy duty at 1 lb 9 oz. This will be a high demand product, order yours now and start living nimble!! 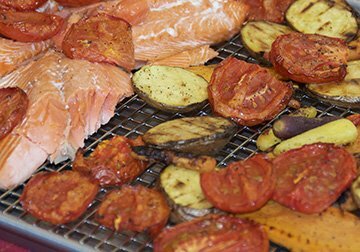 Rack is 100% 304 stainless steel 18/8 grade which makes it EXTRA STRONG, oven safe to 575°F, freezer to oven, to allow flexibility in roasting, broiling, cooling, freezing, baking, and more. Rack has two crossbars and four feet 3/4 " high, with extra heavy gauge wire and smaller grid pattern for maximum strength, no warping. 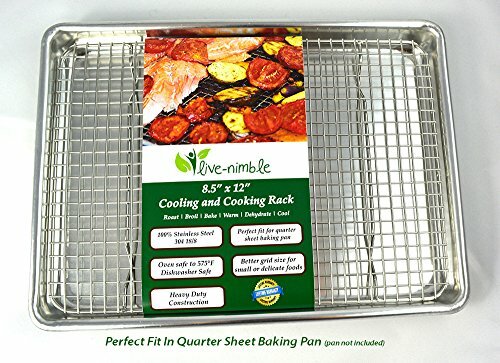 Best rack to set and cool delicate baked goods or roast heavier meats and veggies. 8.5"x12", Fits perfectly in quarter sheet baking pan. NO COATINGS on rack to flake off or emit noxious fumes. Dishwasher safe, oven safe to 575°F. Lifetime no hassle guarantee on rack. EVEN GETS BETTER!! TWO BONUS E-BOOKS - Fifty Nifty Recipes and Roasted Vegetables 2.0 by Nancy Oar - Healthy living recipes for flexible cooking for any lifestyle. Tips on how to best use rack. 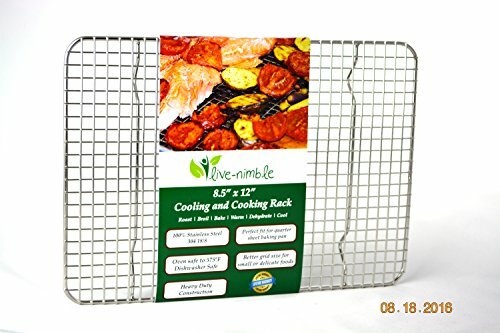 Cook an entire meal on the rack, with easy, no-stick clean up.! !